If you’ve been using Facebook for your iOS device lately, you would possibly notice a new sticky advertisement somewhere at the top, telling you to install an app called “Poke”. 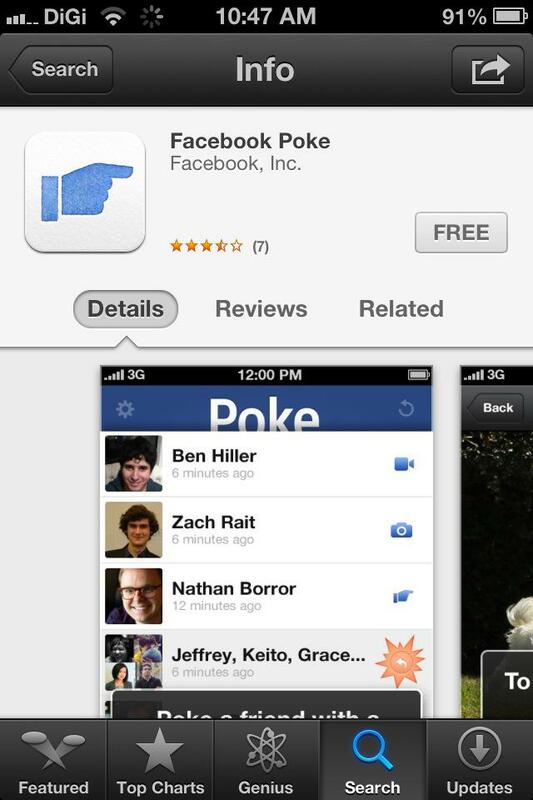 Poke is a new app developed by Facebook that is very similar to an app called Snapchat. 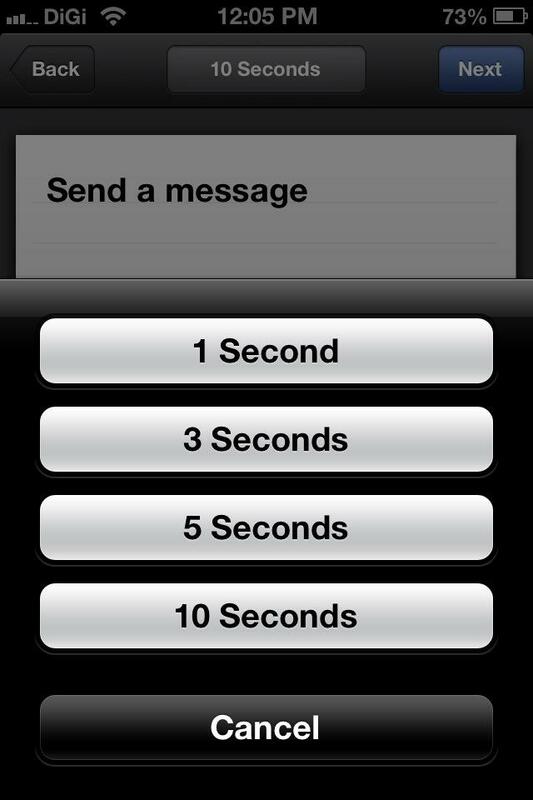 If you’ve no idea what on earth that is, basically what Poke (or Snapchat) allows you to do is send a message to a friend using the same app which will expire in a pre-defined timeline, say, 3 seconds; you can opt from 1, 3, 5 or 10 seconds. The receiving end must press and hold on the message (a text message, picture or video) in order to view it, once the time runs out, the message will expire and become unavailable, the next best sexting tool? 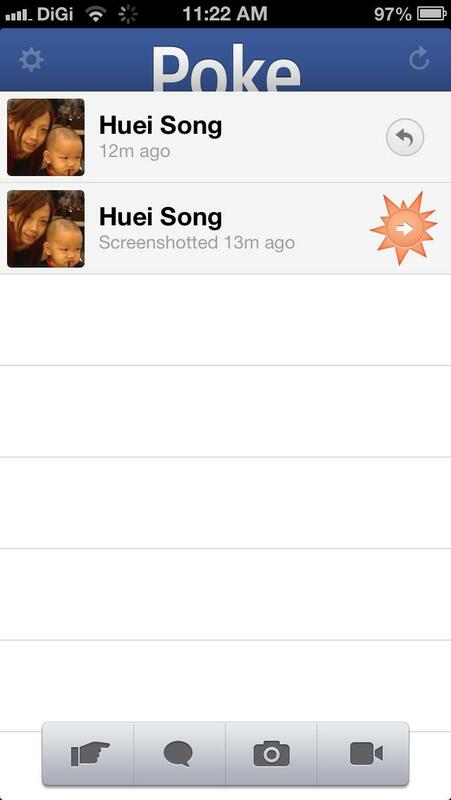 If the receiver decides to take a screenshot of the message, the sender will see a flash icon next to the sent message with a short message saying that the message has been screenshotted. The app has been released for only a couple of days (yes, unlike the Google Maps app, it’s available in Malaysia as well), but it has already made its way to the top of the charts, surpassing the Google Maps app. We had a brief hand’s on this morning so read on to see how it works. Have an important confidential message you need to send to someone? 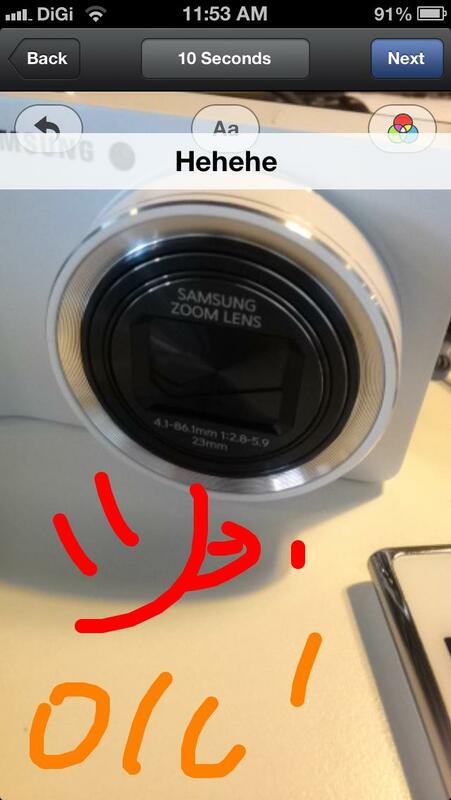 Perhaps, a teaser photo or video that you do not want your friends to keep permanently? Facebook’s new Poke app now allows you to do just that. Like all movies / cartoons with secret missions (The Incredibles is the only one I can think of right now), you can send messages that will sort of “self destruct in 10 seconds” (become unavailable in 10 seconds but “self-destruct” sounds much cooler and makes this app less lame). Facebook Poke allows you to send pokes, test messages, pictures and videos to your friends and set a fixed number of seconds for them to view it before it expires. You won’t unfortunately, be able to select pictures and videos from your gallery, all the pictures and videos you send must be taken there and then; you can even add a caption to your picture followed by some doodle before sending it out. If you send out “confidential” things very frequently, this is a pretty good app too because everything you send will not be available to yourself either; clear the inbox and nobody will know you’ve ever “chatted” with someone. The idea behind having to press and hold to view a message, I suppose, is to make it difficult for users to screenshot the message but it seriously isn’t too difficult to do so, especially if you have up to 10 seconds. If you would like to have a quickie prevent your friends from capturing the private message, I suggest you to keep it short and give them only 3 seconds because by the time they move their finger away from blocking the text or picture, they will only have about 2 seconds to view it before it expires. If you’re afraid annoying Facebook friends, particularly those that you don’t care about, starts to annoy you with “pokes”, you can always report or block them. It only works for people with the app and the app is only available for iOS users at the moment but I suppose it shouldn’t be too long or too difficult for Facebook to release an Android version. Have you played with Poke yet? Let us know what you think.